Between three small rural villages, Gecko Villa nestles with its private swimming pool, amongst the paddy fields in Northeast Thailand. This standalone, three bedroom Thailand villa is exclusively yours during your holiday in the Kingdom. Unlike many villas in Thailand, we offer full board accommodation (rather than self-catering) with delicious, freshly prepared food. The property enjoys a privileged position upon its own grounds, comprising 20 hectares of tranquil gardens, fruit orchards, woodlands, goat and cattle pastures and rice paddies. During your next vacation, why not choose Gecko Villa, make it your own and enjoy the unique and authentic experiences we offer, rather than restricting yourself to a hotel? We look forward to having the opportunity to welcome you to this diverse region soon. Enjoy our fast Wi-Fi throughout the property. It's free! We are a Thai family of six (parents and two sets of twins) living in a village not far from the property. At Gecko Villa we farm rice, tropical fruit and goats. 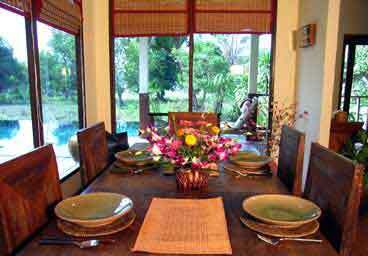 The holiday rental is fully catered with Thai food and is serviced daily. Choose tranquility and complete privacy, making this unique, spacious property your own. (Click to see the floor plan.) Or, allow us to show you the area and introduce you to the ways of countryside life here. We are on hand to make sure that you get the very most from your well deserved vacation. Enjoy the luxury of your secluded retreat: an experience unique in the Kingdom. The Northeast of the Kingdom is reputed for its friendly and good-natured people, who are always ready to welcome those who make the effort to discover their home. Here, in the rural heartlands of Siam (yet easily accessible by road, rail or air), relax amongst the emerald paddy fields, and savour the forgotten rhythms of country life. We take every measure to ensure that your stay is a memorable one, and offer you a rare opportunity to escape from the banality of impersonal hotel accommodation and to immerse yourself in this still unspoiled and undiscovered region. Explore the property online by following the links above for full details on this Villa itself, things to do in the area, and photographs of the house and private swimming pool. The property is located about 20 kilometres southeast of Udon Thani, near the northern shore of Nong Han lake near Kumphawapee, in the country's Northeast. 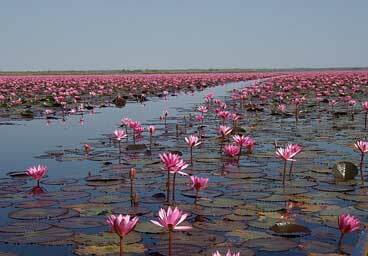 The region is generally referred to as Isaan, Isan, or Esan. It enjoys a countryside setting off the beaten track and away from the tourist crowds, yet many daily flights connect Udon Thani to Bangkok, Chiang Mai and Phuket. The property sleeps from one to six guests. Around the Northeast of the country, "Carbon Footprints" are generally imagined to be what are left on the ground when the locals have stumbled through the ashes of an old fire. Whilst technological terms may not mean much here, there is a definite awareness that the creatures our ancestors once hunted are rarely found today; that the forests of their days have been felled, and that the axiom that there are fish in the rivers and rice in the fields is becoming less apt today. The vast majority of the locals live off the land and still feel their roots here, only migrating through economic necessity. We aim to make a deliberate, albeit small contribution to bringing these trees back, and to encouraging local sources of income through the promotion of indigenous traditions and pride in these, thus stemming the migration of locals to Bangkok and enabling them to enjoy a better quality of life at home. 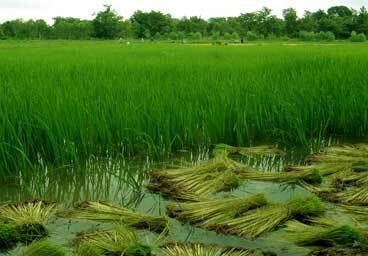 We have a deliberate policy of planting trees around the property, and acquiring existing woodlands where the owners intend to covert such woods into rice fields. We plant and grow organic herbs, fruit and vegetables. Whether you are enjoying a traditional Thai massage here, taking a boat ride amongst the lotus flowers of Nong Han lake, enjoying meals, visiting a school or simply conversing in English with the inhabitants of the area, you can be assured that the local villagers are benefiting directly. The crew of the BBC3 series Blood, Sweat and Takeaways stayed with us whilst filming the episode Rice. We have to date acquired a plot of approximately 20 rai (8 acres or 3.2 hectares) of existing woods, home to numerous species of wildlife, and an area originally slated for conversion for the production of cash crops. We have planted an additional 20 rai with a variety of trees - including teak and other slow-growing, indigenous hardwoods. This wood protection and tree planting is funded with proceeds from our guests' stays at the holiday rental. We are also proud that through the experience of helping to operate the property, a number of villagers can now afford better schooling for their children, whilst others have secured employment in international hotel groups. We do all we can to assist the local Nam Thieng primary school, which provides education to around 165 of the local villagers' children between the ages of approximately 4-13 years. The school has started to earn a name for itself as a guardian of indigenous traditions and practices, and has often put on exhibitions in other areas of the kingdom. Teachers are delighted to welcome guests to the facility: this gives the schoolchildren the possibility of practicing their English, and guests the opportunity to make direct donations to the school, either directly in or in the form of used computers, educational materials and games, clothing, blankets and sporting equipment etc. Gecko Villa was chosen by Thai's in-flight magazine as one of its Top Ten Nature-Friendly Destinations in the world. Thai vacation rentals tend to be situated in tourist traps such as Phuket, Pattaya and Chiang Mai. They tend to offer self-catering accommodation. It is rare to find a secluded house or holiday let for rent in the countryside that offers every comfort for a truly relaxing stay and places an emphasis on contact with the locals. We aim to fill this gap, and to offer a fully customizable stay to visitors. Individuals, families and honeymoon couples may choose to stay in complete privacy, making this house their own during their vacation, or may seek much greater integration. In this latter case, as your hosts, we will be happy to show you the area with its surrounding temples, rice fields and farms, to introduce you to Siamese cooking and food, and to accompany you to local festivals and to the surrounding villages. We will also be happy to help look after your children should you wish more time to yourselves. Special arrangements for guests in the past have included firework displays, pig roasts, an introduction to rice harvesting, marriage ceremonies, and "morlam" music festivals: don't hesitate to let us know if you have any special requests for your next vacation! All proceeds from your stay remain with the locals, and as such your rental will contribute to this sustainable tourism project. A private swimming pool. Delicious Thai food. A friendly welcome and plenty to see and do await you at your holiday home away from home. Visit the villa virtually via our photo gallery. You will find pictures of your holiday home in Thailand and of its peaceful surroundings in the heart of nature in north east Thailand. Book directly with us for the best rates: guaranteed! You can check which dates are still free at this Thai vacation rental here. And remember, there are no pesky extras. Airport transfers, all meals - and even your ice cold beers are included in the quoted rates. Looking for a one of a kind family holiday in Thailand? You'll find it at our Thailand vacation rental Gecko Villa. Get in touch with us now - or Like us on our Social Media below. Copyright Gecko Villa 2019. All rights reserved.